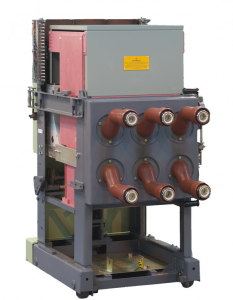 P&B’s range of replacement Reyrolle air breakers and contactors have been designed for total reliability. Utilising a new vacuum contactor and the ABB VC4 vacuum circuit breaker, our Reyrolle retrofits are relied upon for achieving trouble-free performance over many thousands of maintenance free operations. Utilising many parts from the original truck, including the original frame, contact arms, racking and interlock mechanism, the Type S14(A) replacement contactor fits perfectly into your existing cubicle with no alterations. All current carrying parts are fully refurbished and re-plated. The unit is completely re-wired to your specific requirements. Many options are available for this unit, often above your original specification. Utilising many parts from the original truck, including the original frame, contact arms, racking and interlock mechanism, the Type S27(A) replacement circuit breaker fits perfectly into your existing cubicle with no alterations to the existing unit. All current carrying parts are fully refurbished and re-plated. The unit is completely re-wired to your specific requirements. Many options including fused versions are available for this unit, often above your original specification. Utilising many parts from the original truck, including the original frame, contact arms, racking and interlock mechanism, the Type S36 and S45 replacement circuit breakers fit perfectly into your existing cubicle with no alterations to the existing unit. All current carrying parts are fully refurbished and re-plated. The unit is completely re-wired to your specific requirements.